Local members of the Canadian Union of Postal Workers (CUPW) recently reconfirmed their willingness to keep a friendly eye on local seniors who sign up for the Rural Route Reassurance Program. The Prince Edward County Community Care for Seniors Association is one of very few agencies offering this type of reassurance program. 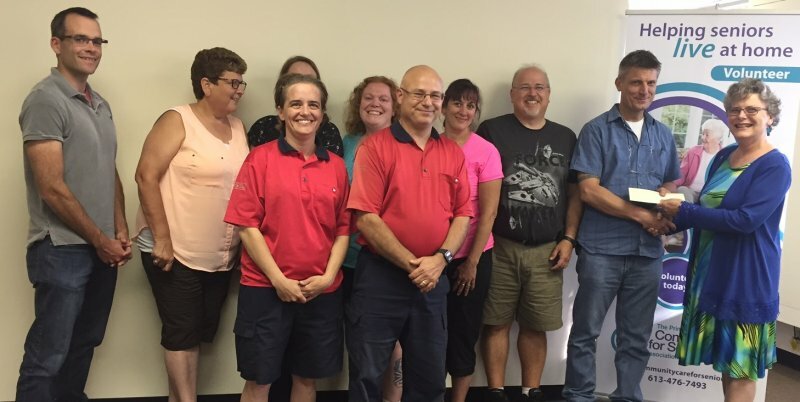 The local Rural and Suburban Mail Couriers, members of CUPW, donated $3,000.00 to Community Care to give a needed boost to this reassurance program. 2017 marks 33 years that CUPW, Canada Post and Community Care have partnered to provide this reassurance program. Seniors need only contact Community Care to register for the Rural Route Reassurance Program. Once requested to do so, Canada Post employees that deliver mail in rural areas will keep an eye open for any signs that a senior might need help. In that event, contact will be made with Community Care, which would take the appropriate action as pre-arranged with the client. Photo cutline: Mark Evard, National Director for CUPW presents a cheque to Debbie MacDonald Moynes from Community Care to support the Rural Route Reassurance Program. Back Row L-R Kyle Copeland, Laurie Istead, Andrea Ferguson (hidden), Pam Peeling, Heather Morahan, Peter McCarthy, Mark Evard, Debbie MacDonald Moynes. Front Row L-R Misty Gregg; Wayne Martin.